IntLawGrrls: ICC referral: sweet, or bittersweet? Some sweet irony in the referral of the Gadhafi regime to the International Criminal Court. As watchers of the Hague-based court at left well know, longtime Libyan leader Moammar Gadhafi long has been a thorn in the ICC's side. It's not just that Libya's not a party to the Rome Statute of the ICC. As the map below shows, the same holds true of many of its Arab neighbors -- and of certain very large states to the west and east of Libya. Rather, Libya's particularly prickly relation to the ICC stems from Gadhafi's efforts to exerts his brand of leadership on the African continent. To cite an example: It's no accident that, as Pittsburgh Law Professor Charles Jalloh, among others, has noted, the 1st African Union resolution condemning the ICC's pursuit of Sudanese President Omar al-Bashir occurred at a meeting in Libya. Libya also is a member of the Human Rights Council, formed in 2006 as a means better to promote human rights within U.N. member states and throughout the world. The Human Rights Council broke with Libya on Friday, as we posted here and here. Reports that the Gadhafi regime had ordered aerial attacks and street-thuggery against its own, unarmed civilians compelled the Council unanimously to urge the General Assembly to suspend Libya's U.N. membership. Last night the Security Council went giant steps further, not only imposing sanctions and an arms embargo, but also referring the Libya matter to the ICC. The vote was unanimous among the T-10 and P-5 alike: ICC nonparty China put aside earlier-reported misgivings, and the United States, another ICC nonparty, openly supported an ICC referral for the 1st time ever. The resolution zeroes in on Gadhafi -- and what little seems left of his regime in the wake of many ministerial defections to the antigovernment side. 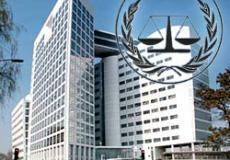 Some cause for concern: The foisting of the costs of ICC investigation onto the ICC and states that choose to contribute. That provision in ¶8 hints at certain lingering reluctances, and serves to remind of the deaf ear that the Security Council has turned to the ICC Prosecutor's pleas for aid in effecting the arrest of international fugitive and still-incumbent President Bashir. It's to be hoped the Security Council's newfound spine will translate into helping the ICC as it endeavors to respond responsibly to yet another weighty referral. It's also to be hoped that the ICC will rise to the "test," to quote our colleague William Schabas; that is, it "must inspire confidence in its ability to provide a meaningful, significant and above all prompt response to the crisis." If not, today's irony may prove more bitter than sweet.